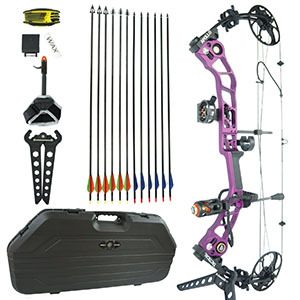 built accessories to get the overall price down which means that you have to switch out at least arrow rests and sights after buying those sets. Often times you have to invest the same amount that you’ve spent for the package again to get adequate acessories. But not in this case. This model literally comes ready to shoot out of the box. It is even ready to hunt out of the box! Everything’s there or pre-installed, ready to be used. You don’t believe me? Well, then I would suggest you read on to find out for yourself if I have promised too much! 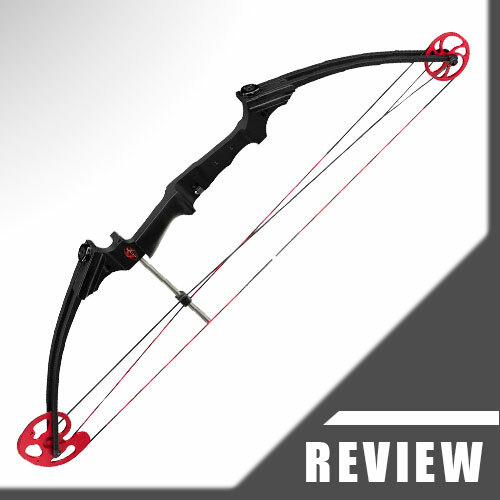 The Apollo Tactical Compound Bow comes in a right or left-handed version (it is not ambidextrous which means you get it either for right-handed or for left-handed shooters; if you don’t know what that means, I would suggest you read my Beginner’s Guide to get an overview of the topic here => Beginner’s Guide To Compound Bows. 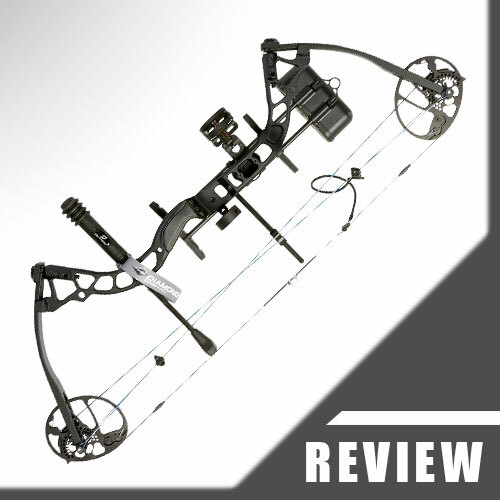 It comes fully assembled, strung and is truly ready to shoot out of the box. Apollo Tactical is a part of Expedition Research, an American company based in Florida. Thus, this model is made in America which is a big plus in my opinion. A lot of the cheaper models are manufactured overseas- but not this one. Additionally, each Apollo Tactical Compound Bow is hand assembled and test fired by this family based company before sending them out to customers. This means that if there were any problems due to production (which I have never heard of so far) they would find those right away, before sending the specific compound out. You won’t get that service anywhere else! 13" - 31" 25" - 30" 26" - 30" 12" - 30"
The UV lighted 5-pin fiber optic sight can be adjusted up or down and from left to right. Because of the UV light this forward sight can be used in low lighting scenarios as well which makes it a very good option for bowhunting (the glowing ring looks cool as hell, if you ask me). Just get glowing nocks for your arrows and you will be good to go for all those twilight hunting trips. The Apollo Tactical does not come pre-sighted as this will depend on your personal shooting style and the draw length and the draw weight that you have set for it. 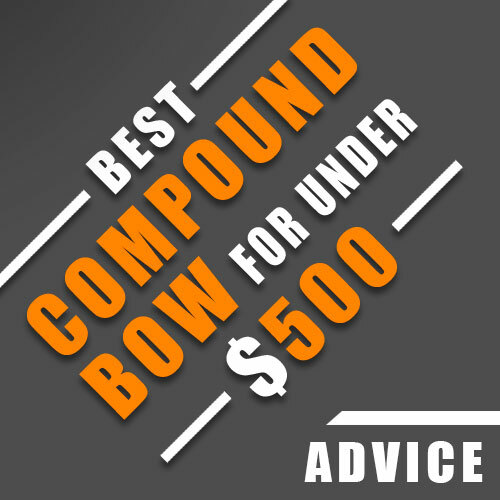 If you want to learn how to sight a compound in, feel free to read my guide here => How To Sight In A Compound Bow. The stabilizer (with dampening) will take out a lot of the vibrations while shooting, thus silencing the Apollo Tactical compound down quite significantly. 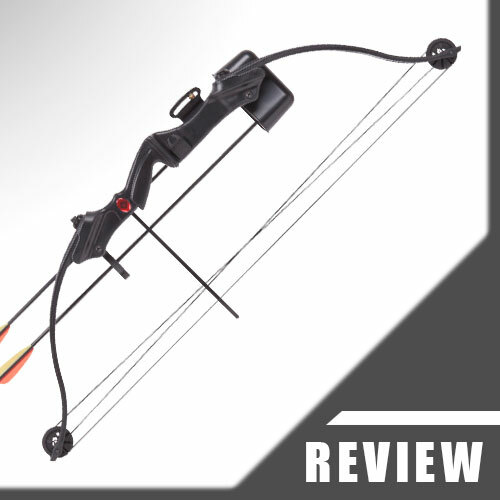 Together with the 6 vibration dampeners on the bow, the string stop and the string silencers the whole thing is as quiet as possible – which is definitely required for bowhunting as the sound travels faster than the arrow so being as quiet as possible is a must. The string comes waxed with a D-loop, peep sight and two string dampeners installed. The D-loop is needed to attach the clip of the mechanical release aid to for pulling back the string. 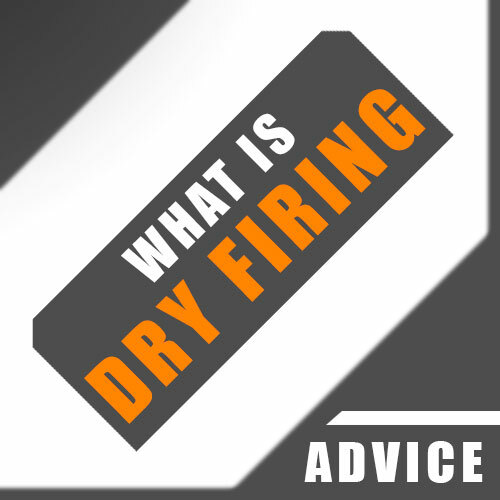 The peep sight acts as a rear sight and needs to be lined up with the forward sight for aiming. The D-loop and the peep sight need to be adjusted to the shooter to get optimal and consistent results while shooting. 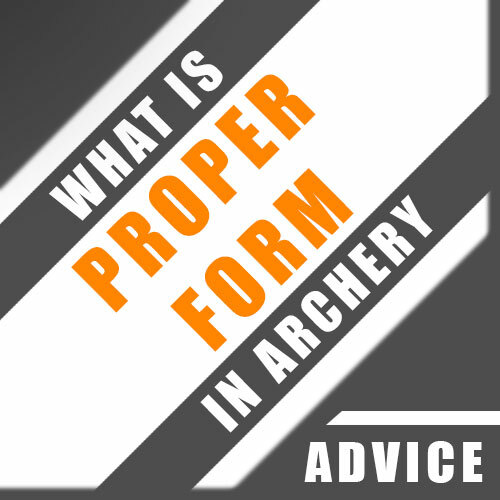 Knowing that, I would take it to a professional bow shop – if I had no experience with compounds – just to make sure that everything fits me as it is. If not, they will adjust a few things for a small fee but that’s really worth it. Compounds need to be adjusted to fit their owners, so I would not trust pre-installed peep sights and D-loops too much. The installed string dampeners take out the vibrations of the string while shooting. The cable stop (again, for taking vibrations out of the shooting process) and cable guide (that prevents the cables from blocking each other while shooting) are made out of carbon fiber which makes them pretty robust but light-weight at the same time. They do their job quite well. 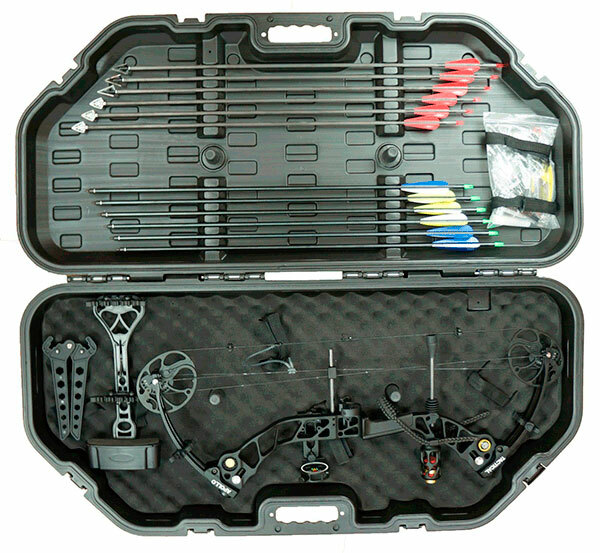 A highlight of this package is the Hard Bow Flight Case for carrying and storage of the Apollo Tactical. It is the only double walled case available on the market at the moment and it is definitely of a professional grade. This is very impressive especially when you take into account that it is manufactured in China. Yep, you have read right: China. Nonetheless this is one of the best cases out there – if not the best. It is valued at $ 200 alone. The Apollo Tactical case has four latches and a gasket which makes it quite water proof. Okay, I wouldn’t drop it in a lake, but as it is moisture won’t be able to creep inside. Because of this the case is also good for storing the compound. Everything inside it can be sealed down so nothing will move when you open or close it or while you are carrying it around. The compound itself is secured by four straps inside the case. 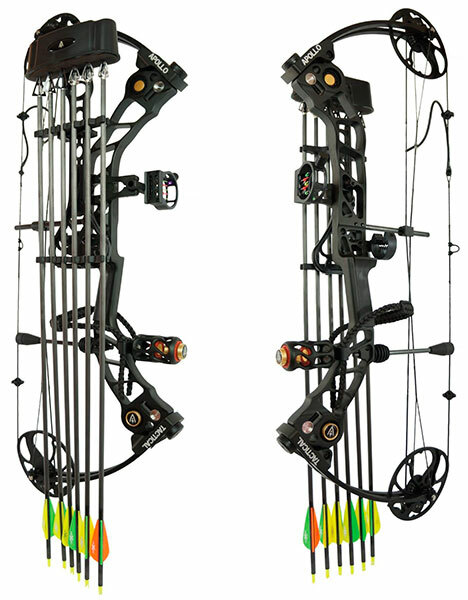 The detachable quiver is not in the way while shooting at all (which adds to the overall great design of the whole system) and is able to contain 6 arrows. It makes a very good impression as well and seems to be of a rather good quality. 2 additional limb dampeners for taking out even more vibrations are integrated into the limbs of this model, making it more quiet (can it really be any more quiet after all the dampeners I mentioned already? 🙂 ). You will also get a bow stand for the Apollo Tactical which can come in quite handy from time to time (imagine you are attaching or detaching things to or from the compound). So instead of putting it on a table or leaning it against something, you can simply put it on its stand. Arrows are very important as they need to fit the Apollo Tactical (draw length, draw weight), the shooter (personal draw length) and the purpose (hunting, target shooting). 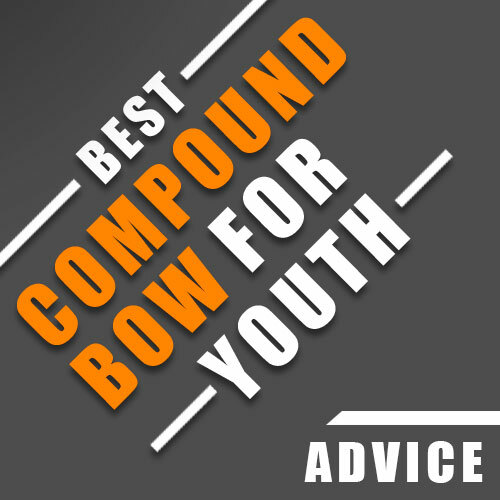 If you’d like to learn more about choosing arrows, feel free to read my guide here => Choosing The Right Arrows For A Compound Bow. Apollo Tactical gives you a high quality collection of arrows to start out with. Along with the compound come 6 rugged aluminium arrows and 6 fast carbon mix arrows with 6 field tips (target shooting) and 6 razorsharp laser-edged broadheads for bowhunting (3 silver heads, 3 black heads, different designs). You also will get a mechanical release aid (caliper release) included in this package that you need to be able to pull the string back (needs to be clipped to the D-loop on the string). You could finger-shoot the Apollo Tactical, but finger-shooting is not recommended for compounds in general as your fingers might torque the string (especially at release) and thus affect the flight of the arrow, resulting in bad shots which you don’t want to have when hunting or target shooting. The included bow sling comes in quite handy as well. It attaches the Apollo Tactical to your wrist and lets you hold it with a rather relaxed grip – which is important to shoot accurately. After releasing the arrow we tend to tighten our grip so that the compound won’t drop to the ground. When we do this our muscles in the hand and wrist might torque the whole bow, affecting the flight of the arrow. The bow sling lets us loosen our grip after the shot and therefore prevents us from torquing and the compound from falling down. Apollo Tactical also included wax for the string and cables. Waxing those parts regularly is important as well as it will prevent them from getting worn too early, which means you won’t have to switch them out sooner rather than later (which you should do once a year anyway). The hex key tool that comes along with this model is for adjusting the draw length and draw weight (Allen wrench set), which is pretty easy to do. Apart from all the accessories mentioned above, you will get a spare case latch, a spare D-loop and spare waxed string / cable serving material. I assume you get the extra latch because someone lost one on his or her case, but I never heard of that actually happening, so it’s just an assumption. I also want to add that customers get spare parts at factory costs (string, cables, limbs, cams, etc.) which is a big plus as well, in my book. The warranty contains the following: a Lifetime Warranty on the main riser, a one year warranty on accessories / options, plus consumable parts are available at cost from the factory. And in case you are experiencing any problems Apollo Tactical’s customer service is just awesome and will help you out right away – and as they are a family based company you can contact them at any time! And that’s a really big plus in my opinion. This compound is just unbelievably quiet. With all the dampeners on this model there is nearly no audible sound while drawing and releasing it. And concerning hand shock: The parallel designed split limbs take out all of it so you won’t feel a thing while shooting. The Apollo Tactical compound bow is made mostly out of CNC milled billet aluminum (think body, riser, cams, etc.) which makes it really sturdy and durable and proves great craftmanship. It feels well balanced and very well made. Its axle to axle length is 30“ which is quite good. It’s not too big so you won’t get any problems in areas with dense vegetation, which is great for bowhunting. The riser is CNC milled from proprietary light weight aluminum alloy. It has a built in weighted dampening system to get rid of vibrations and thus noise while shooting (the heavier the riser the more vibrations it will take out). The weights of this system are suspended in a mesh of rubber. They also applied this system to the stabilizer which means more accuracy for you while shooting. The grip feels very comfortable, by the way, which is very important as well. At least to me: I hate it when the grip feels uncomfortable and I surely know that this is often times a personal thing. But some grips seem to be designed to fit kinda standard hand sizes which means it will fit rather more people than not. And I think that’s the case here as well. The net weight of the Apollo Tactical ranges from 4 – 4.8 pounds, so the weight depends mostly on the accessories that you put on the compound. More accessories lead to a heavier bow which is not a bad thing, as heavier models tend to shoot more accurately as they take a lot of vibrations out and are more stable in general. Just make sure that it does not get too heavy because this might become a problem when holding it for hours while hunting in the field. All in all the Apollo Tactical made a very good impression. Its finish and construction truly are more on the premium side of things as are the accessories that come along with it. Great quality made in America. The Apollo Tactical Compound Bow is very smooth to draw. Its dual cam system makes shooting it a breeze while its solid back wall gives you a good and consistent reference point, which leads to better accuracy overall as it makes repeatable results possible in the first place. 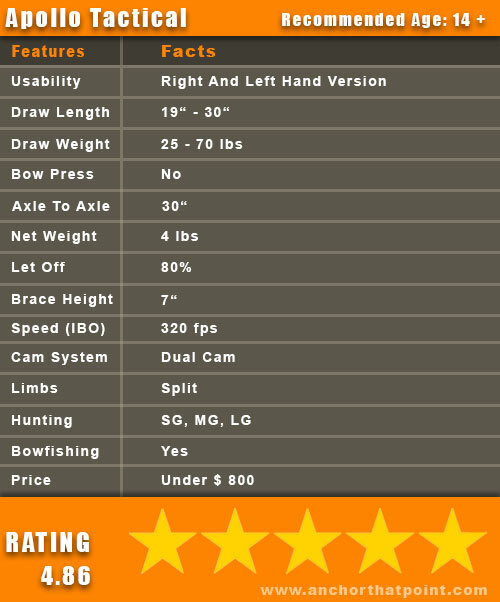 The draw weight ranges from 25 to 70 lbs and guess what: that’s quite a range. This model could literally grow along with teens for years. For adjusting the poundage you only need one of the Allen wrenches that are included in the package. Loosening the limb bolts will decrease the poundage, tightening them will increase it. Make sure that each bolt has the same amount of turns! If you are unsure, just tighten the bolts to the maximum and start over from there. Expect to lower it a bit as the compound comes set to its maximum poundage of 70 lbs – which is quite a bit 🙂 . The draw length of the Apollo Tactical can be set from 19″ to 30″ which covers most of the draw lengths of tweens, teens and adults. It can be adjusted with the included Allen wrench as well and you definitely need no bow press for doing so. For those of you who don’t know what a press is good for: A bow press is needed to take out the pressure of certain compound bow models to be able to adjust them because contrary to a recurve compounds do not need to be unstrung – which forces you to buy a bow press for yourself or to bring your compound to a professional shop for adjusting the draw length in case you buy such a model. You won’t have these problems with the Apollo Tactical, which is just great. The let off is 80%. As this is not that wide, it is still in the range that seems to be common with the actual modern models available. It may not be as comfortable as a let off of 65% for starting out but it still should be wide enough to learn proper form for shooting without much hassle. The valley is a bit shorter but there is enough room for aiming, in my book. The brace height is 7″ which is pretty standard. I should add that the Apollo Tactical performs best when the draw weight is set between 30 to 70 lbs, which is pretty normall as all compounds will have tighter groupings consistently with higher poundages. So nothing to worry about there. Apollo Tactical states a speed of 100 – 320 fps rated after the IBO (International Bowhunting Organization) requirements, which are a draw weight of 70 lbs, a draw length of 30″ and an arrow weight of 350 grains. So the maximum speed of 320 fps was calculated with a draw weight of 70 lbs (don’t forget that!). Just don’t forget that every little adjustment can bring the KE down. 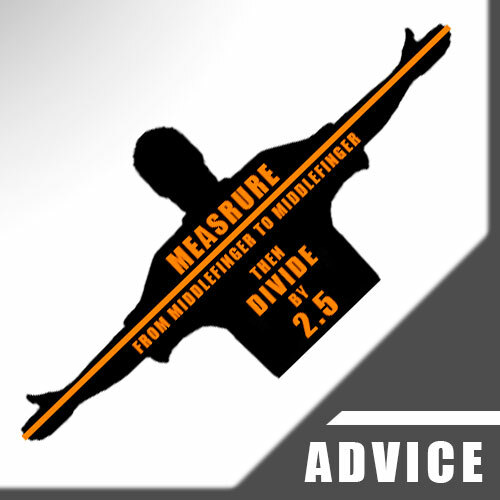 If you lower the poundage, if you use heavier arrows, if the distance to the game is larger, if the weather conditions are bad, etc. All this can lower the achieved Kinetic Energy, so in the end you have to decide for yourself which game you will go for and if you can take it in a humane way. If you want to learn more about Kinetic Energy and how it is calculated feel free to read my article about it here => Kinetic Energy For Bowhunting. A bowfishing reel can be attached without any problems and the compound is strong enough to penetrate the water and hit the fish with enough power. So yes, it definitely can be used for bowfishing. With a price point around $ 750, the Apollo Tactical does not seem to be that affordable at first sight. But if you add up all the accessories that come along with it, you would be way above 1000 bucks in my opinion. A lot of other sets out there contain pretty cheap accessories and are mainly manufactured overseas to push the price down. This results more often than not in good basic compounds but crappy add-ons in general, so you are forced to switch those out against higher quality versions to be able to get great and consistent results while shooting. These will add up quickly to a few hundred bucks that you have to invest in addition to the bow. This is definitely not the case here. You only get well made valuable accessories that are of a high quality and you surely don’t need to switch out a single piece to get good results. What you get is just great – and made in America by a well established American company. That’s what I like best about it. So if you can afford it, I would suggest you rather invest in your own country than some factory that is based overseas. Just saying 🙂 . I hope I was able to present you the Apollo Tactical without sounding too salesy. But to be honest, there is nothing negative about it. Just read some of my other reviews and you will see that I clearly point things out that I am not satisfied with but well, I simply was not able to do that in this case as there is nothing to point out that bothered me. You will get a great American product of high quality that comes in a package that contains everything you need for target shooting or bowhunting, and it is not missing a single thing for doing just that. It is truly a ready to shoot / hunt out of the box set. Just pick it up and start! Its wide and simple adjustability makes it great to grow along with youth archers for years, which also makes it a good option for adult beginners that are just starting out, or seasoned bowhunters that maybe need to lower the poundage temporarily (think shoulder injury or recovery). 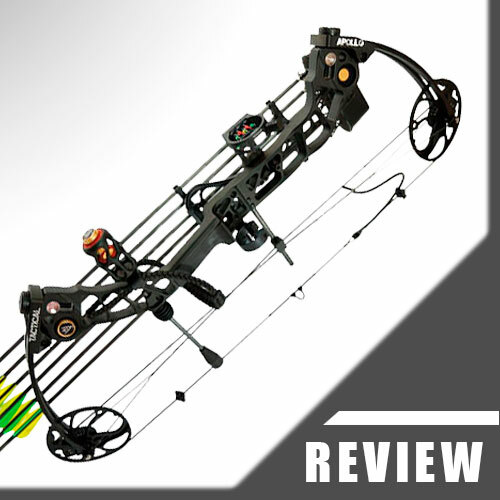 Great flexibility is always a great advantage – and you will get lots of it with this great compound bow. There’s no doubt about it. Like I have already mentioned above – and normally I hate to repeat myself – the value that you get with this package exceeds the amount you have to pay for it by far, so it’s totally worth it and you will invest in your own country if you are going to buy one – and what could be better than that? Thanks for reading and shoot straight (which is no problem with this compound at all… just saying)! Did you try ordering via Amazon or via Apollo Tactical directly?